In 1974, Johnny Cash released an album that included “That Raggedy Old Flag.” It is a spoken word tribute to the flag of the United States, and it speaks of patriotism and how our flag has led us in battles and wars. On June 14, 1777, the Second Continental Congress passed the Flag Resolution which stated: “Resolved, That the flag of the thirteen United States be thirteen stripes, alternate red and white; that the union be thirteen stars, white in a blue field, representing a new constellation. There is mystery over who made the first flag and where it was first flown. The Betsy Ross story is the most popular, though there is no credible historical evidence to prove it so. The story started in 1870, almost 100 years after the first flag was supposedly sewn, when William Canby, Ross’s grandson, told the Historical Society of Pennsylvania in Philadelphia that his grandmother made the flag at George Washington’s request. His evidence was based solely on family tradition. While Ross did make flags in Philadelphia in the late 1770s, it is all but certain that the story about her creating the American flag is a myth. She is attributed with changing the six-pointed star to a five-pointed star, because it was easier to make. I don’t believe it truly matters as to whom sewed the first flag. Americans love our flag. It is displayed on homes, at government offices, in parades, and at funerals. In our home, we proudly displayed my dad’s folded flag and my husband’s grandfather’s folded flag. Truly its symbolism can bring a tear to a veteran’s eye or a smile to a child reciting its pledge. From America the Beautiful to Yankee Doodle Dandy, lyrics about this flag stir our hearts. Yes, to this continued stirrings of our hearts and our belief that Tis the star-spangled banner: O, long may it wave O’er the land of the free and the home of the brave! Next Sunday, October 7, 2018, there will be a celebration of the Battle of Kings Mountain at Kings Mountain National Military Park in Blacksburg, South Carolina. 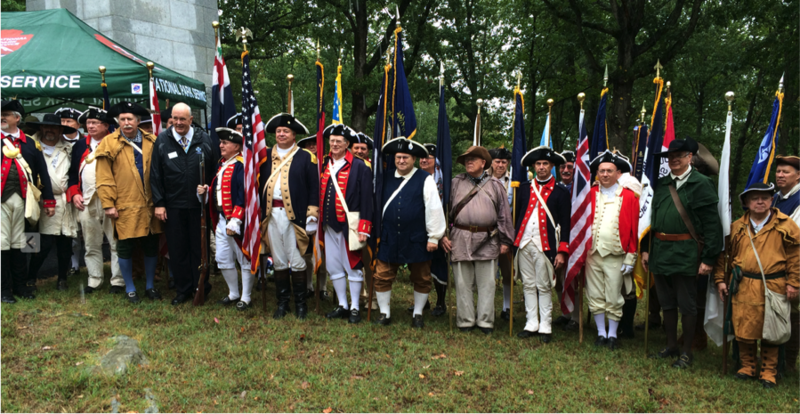 Join Living History Interpreters for the 238th anniversary encampment of the Battle of Kings Mountain. Learn about the men and women who fought in this significant battle of the American Revolution. Thomas Jefferson called this battle “The turn of the tide of success.” The battle of Kings Mountain, fought October 7th, 1780, was an important American victory during the Revolutionary War. The battle was the first major patriot victory to occur after the British invasion of Charleston, SC in May 1780. The park preserves the site of this important battle. Posted in Uncategorized and tagged Battle of Kings Mountain, Betsy Ross, Flag Resolution, Johnny Cash, Thomas Jefferson, Woodrow Wilson. Bookmark the permalink. When the 56 Signers of The Declaration of Independence signed their names to that document, each knew they were committing treason against the British Crown. If caught and captured, they risked death. But death would not be swift. It would be by hanging to the point of unconsciousness, then being revived, disemboweled, their body parts boiled in oil and their ashes scattered into the wind. Our Founding Fathers valued freedom, for themselves and their posterity, to the extent that they found this fate worth the risk. The Declaration of Independence identified the source of all authority and rights as “Their Creator,” and then accentuated that individual human rights were God-given, not man-made. In that core group of delegates, according to public record were 28 Episcopalians, 8 Pres- byterians, 7 Congregationalists, 2 Lutherans, 2 Dutch Reformed, 2 Methodists, Roman Catholics, 1 unknown, and 3 deists (those who believe in an impersonal God), who gave the world its initial impetus but then left it to run its course). Pictured above: Thirty-three-year-old Thomas Jefferson wrote most of this document. In approximately two weeks, he penned it in two rented rooms in the home of Graff, a noted bricklayer. The universal words were carefully chosen, but it was individuals who signed their names. 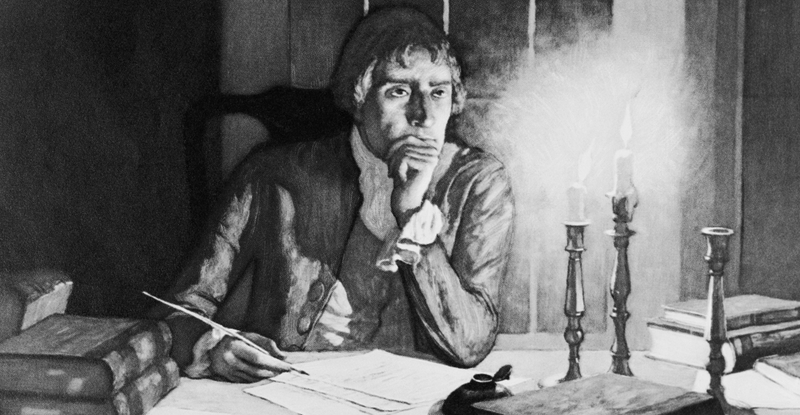 The Declaration of Independence was seditious and a break-up letter never to be forgotten. What were their professions? Twenty-five were lawyers or jurists. Eleven were merchants. Nine were farmers or large plantation owners. One was a teacher, one a musician, and one a printer. These were men of means and education, yet they signed the Declaration of Independence, knowing full well that the penalty could be death if they were captured. Five were captured by the British and brutally tortured as traitors. Nine fought in the War for Independence and died from wounds or hardships they suffered. Two lost their sons in the Continental Army. Another two had sons captured. At least a dozen of the fifty-six had their homes pillaged and burned. Seventeen lost everything they owned. The British jailed Francis Lewis’ wife for two months, and that and other hardships from the war so affected her health that she died only two years later. Thomas Heyward, Jr., Edward Rutledge, and Arthur Middleton, all of South Carolina, were captured by the British during the Charleston Campaign in 1780. They were kept in dungeons at the St. Augustine Prison until exchanged a year later. The basement of Independence Hall in Philadelphia once served as the city’s dog pound, and the second floor was once the home to Charles Wilson Peale’s museum of natural history. Windows were kept tightly closed, so that others could not hear their discussions. It is said that the elder statesman, Benjamin Franklin, would intentionally trip other delegates from his aisle seat. Serious, thoughtful, careful were the discussions, and sometimes quite loud. “If we wish to be free, if we mean to preserve inviolate those inestimable privileges for which we have been so long contending, if we mean not basely to abandon the noble struggle in which we have been so long engaged, and which we have pledged ourselves never to abandon until the glorious object of our contest shall be obtained, we must fight! 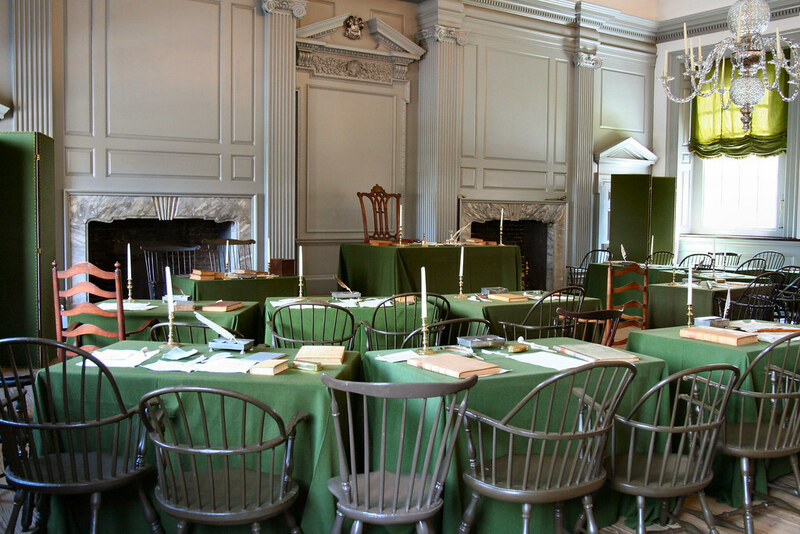 And it happened here in the Assembly Room of Independence Hall in Philadelphia, Pennsylvania. This is why we celebrate July 4, 1776. Posted in Uncategorized and tagged Declaration of Independence, Independance Hall, John Adams, Patrick Henry, Philadelphia, Thomas Jefferson. Bookmark the permalink.